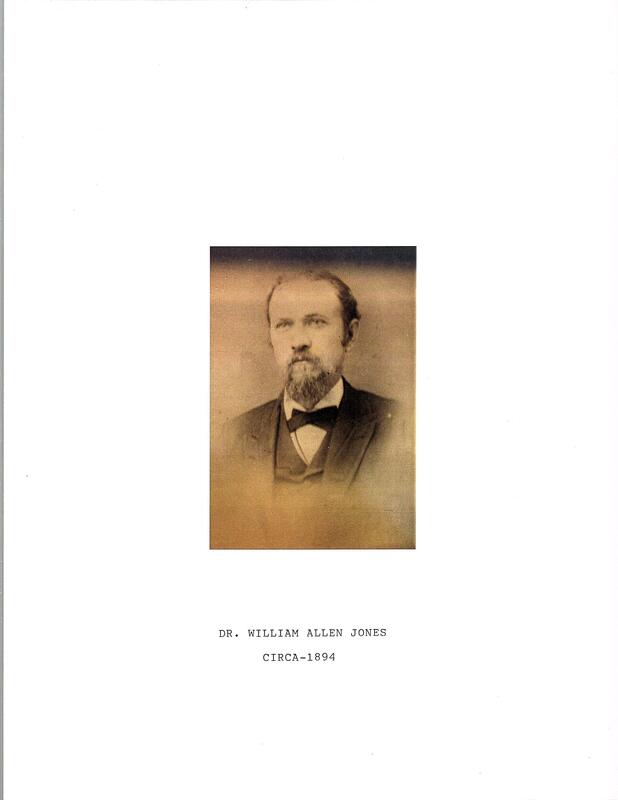 Dr. William Allen Jones was born November 1, 1858, the only child of Dr. George W. and Elizabeth Whitehead Jones. He was born in what was known as Sheepskin Valley near Wolverton Mountain in the vicinity of Springfield, Conway County, Arkansas. His father died of pneumonia when William Allen was only two and one-half months old. After his father’s death, Elizabeth took her young son and returned to her mother’s home in the Lick Mountain Settlement, where William Allen was raised by his mother and grandmother. His early education was in a one-room school by the name of Sunnyside, said to be the first organized school district in the county. He afterwards attended the academy at Springfield, and the Judson Baptist Academy at Judsonia, Arkansas. In 1877-78 he attended the University of Arkansas at Fayetteville; and for a short time studied physics under Dr. David J. Warren, of Atkins, in Pope County. In the fall of 1878 he entered the Eclectic Medical College at Cincinnati, Ohio, graduating from that school in 1880, and immediately launched into his practice at Atkins. After about one year he returned to the neighborhood of his boyhood where his practice met with increased success. In February, 1889, he moved to Morrilton where he soon built up an extended practice. Dr. Jones inherited a 200 acre farm from his father’s estate, and added many acres to his land holdings. In 1885 he married Mrs. Marietta Adams Hunter, whom he had dated while in school at Judsonia. In the meantime she had been married, had a son, and was widowed. In addition to her son by her first marriage, three sons and a daughter were born to this union. In 1890 or 1891, Dr. Jones sold out in Arkansas and moved to Wichita Falls, Texas, where he set up practice. He also went into the mercantile business with a cousin, and he and his father-in-law bought a farm together. The third son, Herbert A., was born here on January 2, 1892. That year there was a draught, the crops failed, and his collections fell off. He moved to Iowa Park, a smaller town, and in October, 1893, the only daughter, Laura, was born. About a month after Laura’s birth Marietta died of post-partum complications. This left Dr. Jones with four sons (counting his stepson) and an infant daughter, past-due accounts on his books–both his medical practice and the mercantile business, and a farm that was not bringing in any income. In addition, he was not receiving the payments on the farm he had sold on time contract in Arkansas. Dr. Jones’ mother-in-law, father-in-law, and sister-in-law came to his rescue in taking care of the children. Borrowing money from relatives back home, they returned to Arkansas. Reclaiming his farm, he rebuilt the house which had burned, and hired an overseer to take care of the place, while he, himself moved into Plumerville, a few miles to the south, and established a good practice there. After about a year in Plumerville, he built a home there and sent for the children and the grandparents. The grandparents stayed on with the family until Dr. Jones remarried. In 1895 he married Miss Sara Frances Steele, a daughter of Dr. Marion DeKalb Steele, of Elm Springs, Arkansas. To this union were born three sons, Bryan Steele, Thomas Harold, and Chauncy Doyle. Two of his sons became doctors: William Edgar (his oldest son by his marriage to Marietta), and Thomas Harold, the second son by Sara Frances. Dr. William Allen Jones died of Bright’s Disease on April 18, 1915. He is buried in the Plumerville, Arkansas cemetery.